A contemporary cocktail bar is no longer just defined by its beverage programme alone. The food menu has become an essential component, and patrons enter a bar expecting the best of both worlds. Though many cocktail bars score on that front, Zui Hong Lou sets itself apart by being one of the few that applies local flavours to both its food and drinks. Also known as Drunken Red House, Zui Hong Lou first started out as a dim sum bar in 2013 on Amoy Street with the gaudy decor you’d expect from a Chinese tavern. Five years on, it has reopened on Club Street under the Establishment Group, joining the ranks of Gem Bar, Nutmeg & Clove, and Wanton, Seng’s Noodle Bar. It has also been given a fresh coat of paint, including a wall mural courtesy of local graffiti artist Rajesh Kumar. 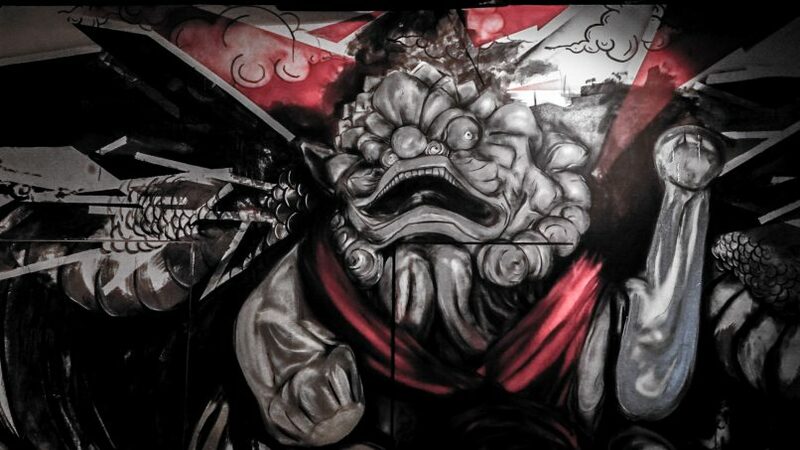 The wall mural at the entrance of Zui Hong Lou, painted by Singaporean graffiti artist Rajesh Kumar. Head chef Clement Goh helms the kitchen, while his counterpart Sufi Hizrian handles the tipples. The two are seasoned industry veterans, with the former having spent time in the kitchens of Bacchanalia and the Ritz-Carlton Singapore, and the latter’s decade-long experience includes stints at Oriole Bar in London. 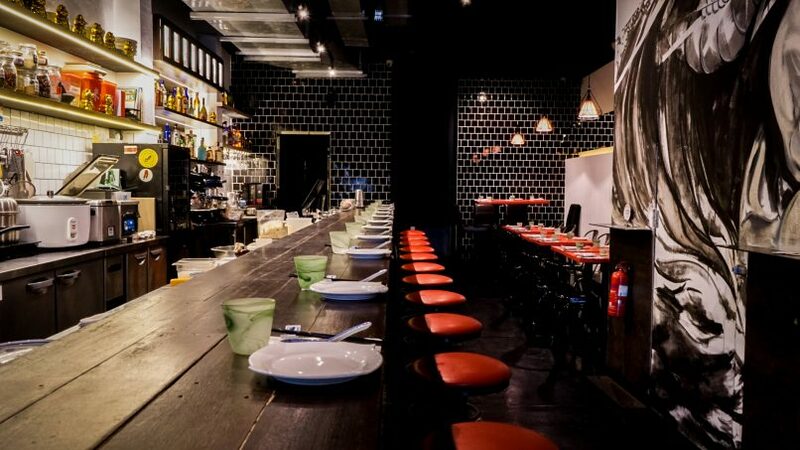 Zui Hong Lou is nestled among the other Club Street watering holes. It has been updated with a more modern facade when compared to its predecessor. Eighteen zhao cai maos (fortune cats) greet you with their waving paws as you step into the establishment. Have a seat at the bar if you’re feeling chatty, or at the tables if you’re in a bigger group. Like traditional Chinese eateries, it is strictly no-frills, perfect for loud and boisterous gatherings. Don’t come expecting to find any intimacy in a corner or a nook. A common element Zui Hong Lou shares with other shophouse-turned-eateries is its bar seats. Patrons seated there get a front-row view not only of the bartender crafting cocktails, but of the chefs preparing the food too. Look closely at the shelves behind the kitchen staff and you’ll see a box labelled ‘ketamine’. We were assured it was not the drug. At Zui Hong Lou, you can expect the cocktails to come with an Asian twist. The Kopi Gin Tonic (S$15) for example, is made with Bankes gin infused with an espresso cold brew. A pity that Zui Hong Lou doesn’t open before office hours. We foresee a drink like this to be a favourite with lovers of caffeine and alcohol. 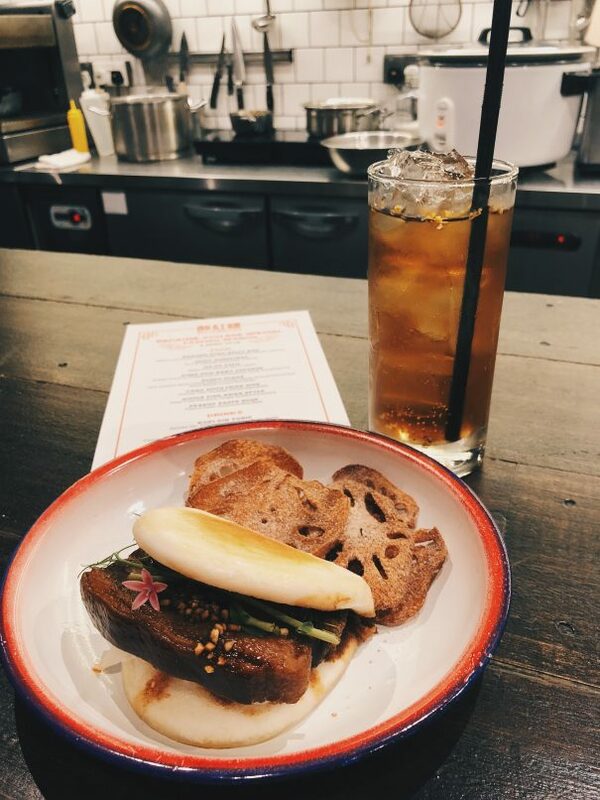 The braised pork belly bao and Kopi Gin Tonic cocktail. There is also the Breakfast Club (S$16) for those who prefer a creamier concoction. It’s a mixture of Mount Gay Eclipse rum, coffee-infused averna, kaya oat milk, evaporated milk, and egg yolk. Served inside a little jar with a lid, we recommend you shake it up before consuming, else it might be a bit jelak (or overly rich, as us Singaporeans would say). It didn’t have the flavours one would’ve associated with the ingredients, and felt more like a digestif than a “breakfast” drink. The cocktails are reminiscent of what some of our other favourite local-inspired bars have done, but fail to pack the same punch and pizzazz. We chalk this up to the establishment’s infancy, and can’t wait to see what Zui Hong Lou comes up with in the near future. Despite the prosaic selection of cocktails, the food menu at Zui Hong Lou shines through. The selection of baos offered are familiar, yet jazzed up with contemporary touches. Its braised pork belly bao (S$9 for two) took the kong bak bao we all love and know, and gave it additional flavours with pickled cabbage, cilantro, and peanuts. 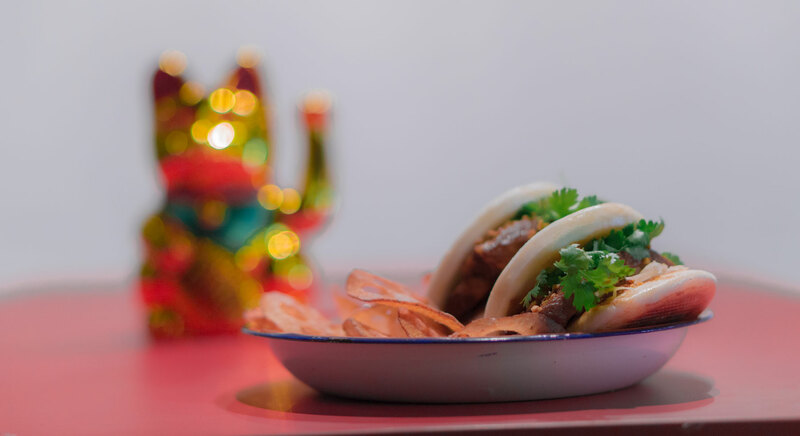 A juicy, tender slice of pork belly is served in between a pair of steamed buns that have been pan-fried to give it a crispy outer layer. It is also served with fried lotus root sprinkled with plum powder for more crunch. What’s a Chinese dinner without spicy food? The mapo tofu (S$7) and soupy clams (S$16) will be sure to tickle your taste buds. However, that’s all these dishes do: Tickle. Which means diners who can’t tolerate spice too well, will have an easier time. But don’t order them expecting the mouth-numbing spiciness of Sichuan cuisine. 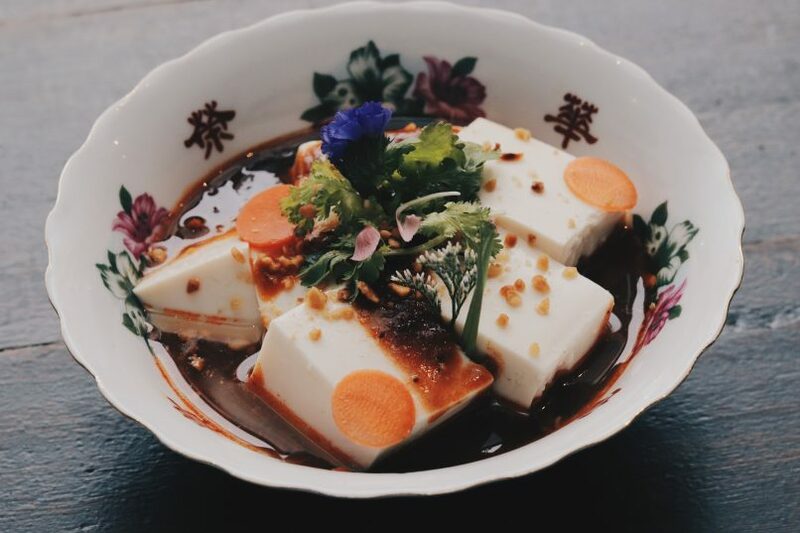 The silky smooth Ma Po Tofu is served cold, a contrast to the hot sauce. There is also a variety of dumplings to choose from: Soup, steamed, or spicy. The skin of the dumplings are handmade by a family friend of The Establishment. It is thicker than what we are normally accustomed to, allowing for the broth to soak into the skin for a more delectable bite. The most comforting dish we had was the Whole Fish Asian Style (S$28). The fish in question is a fresh sea bass that has been deep fried, split into two, and decorated generously with a dressing of ginger scallions. Eating it might get slightly messy, but it is worth every calorie that comes with each mouthful. It reminded us of home-cooked dinners made with love. Zui Hong Lou is a no-frills bar and diner that’s perfect for guests who want to indulge in familiar, comforting dishes paired with cocktails. Unfortunately, the drinks are currently overshadowed by the hearty, savoury grub. We’d gladly make a return trip for the food alone. For now, let’s give the cocktails some time to find their footing. Price: S$50-S$70 per person for two cocktails and a couple of dishes from the menu.